Georgetown Fence :: KURO shou sugi ban Exterior Fence - reSAWN TIMBER co. Located in northwest Washington DC, Georgetown is the perfect intersection of historical charm and upscale modernity. The beauty of Georgetown’s cobblestone sidewalks, grand homes and peaceful C&O Canal are only part of the draw to this tree-lined historic neighborhood – as home to some of the city’s top shops, tastiest restaurants and most luxurious hotels, Georgetown is a favorite of tourists and locals alike. Drawing on Georgetown’s upscale charm, Campion Hruby Landscape Architecture and Redux Garden & Home collaborated on this gorgeous outdoor space. Incorporating modern accents, like unique art installations and lots of greenery, they created a space that feels contemporary and charming. As the backdrop of the entire space, they chose to include reSAWN’s KURO shou sugi ban charred cypress as their fence, lining the entire area. KURO features CHARRED CYPRESS burnt in the Japanese style of shou sugi ban. KURO can be used for interior or exterior wall cladding. For exterior cladding, we offer Select Grade. For interior applications, we offer #2 common and Select Grade. The higher the grade, the better it is felt the wood will perform, especially in exterior applications. See our CHARRED Grading Guide for more info. KURO can be treated to Class A Fire Rating for Interior Application – please call to inquire. KURO shou sugi ban is carefully charred, misted with water, cooled, brushed and then stained/sealed. The top coat sealer is applied prior to shipping (for exterior applications, we recommend sealing the back side as well as the face). The burning process accentuates the wood grain and creates varying colors when viewed from different angles and in different light. 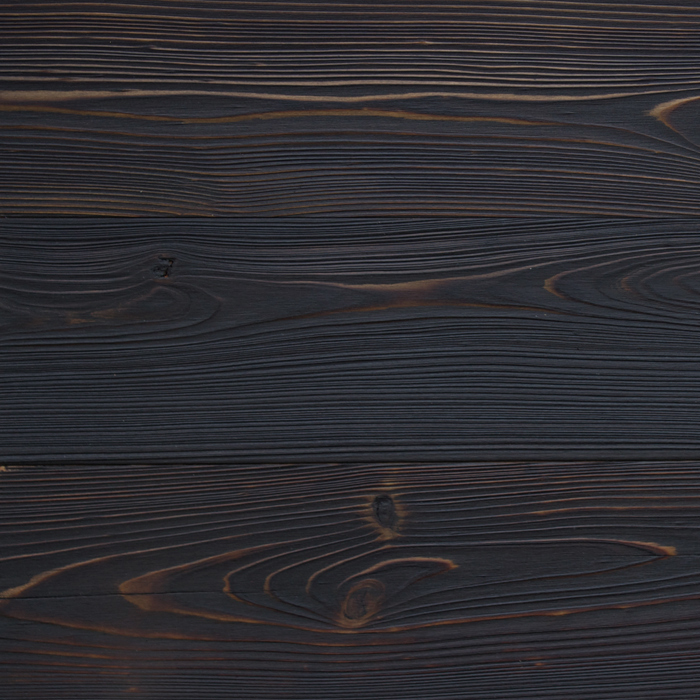 KURO shou sugi ban is made with cypress sourced from the Southern United States and can be used for interior wall cladding, ceiling cladding and exterior siding. With its legendary beauty and natural durability, cypress has long been a staple as an exterior wood siding product. Because cypress generates its own preservative oil, called cypressene, it’s an ideal wood for locations with constant heat, humidity, and torrential rains.